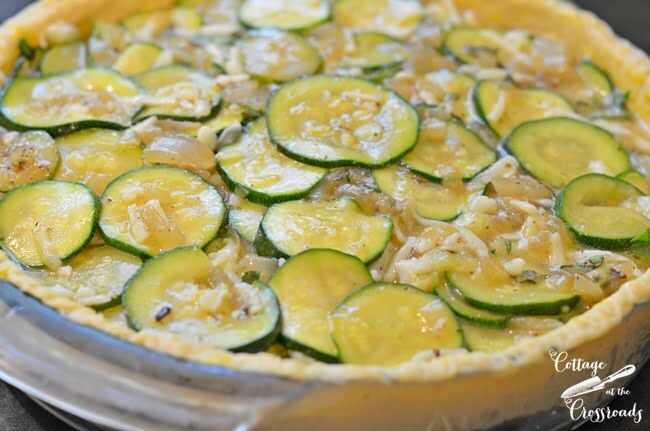 Whether you have a bounty of zucchini from your garden or you pick up some from a farmer’s market, you are going to love this savory Italian Zucchini Pie! 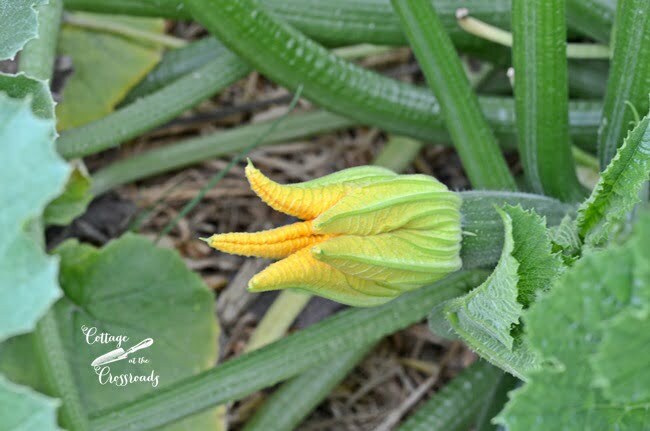 It is so good that even folks that swear that they don’t like zucchini, love this! 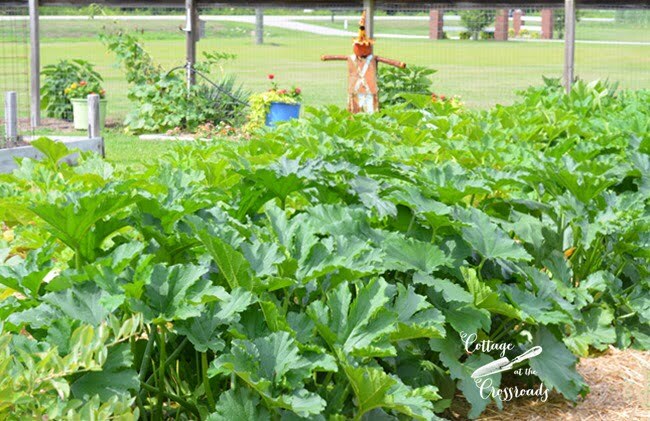 Our zucchini plants look like they are on steroids and are producing a lot of zucchini, so much that I have to gather it twice a day. In the early morning, I will see a blossom like this, and if I don’t harvest it later that same day, it will look like a baseball bat by the next day! Searching for good recipes to use this bounty from the garden, I remembered this pie recipe by my good friend Ron Horne that was published in our school cookbook a number of years ago (so many that I don’t even want to figure it out!) The cookbook has lost its spiral edging due to our dog Lucy grabbing the cookbook off the counter when she was a puppy. Luckily I was able to save most of the recipes and I keep the pages in a baggie. Ron brought his Italian Zucchini Pie frequently whenever we provided food for Fat Friday at school. Everyone absolutely loved it and begged him to put his recipe in our school cookbook, and I am so, so glad that I still have it! 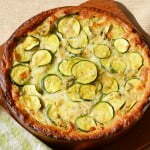 To make this Italian zucchini pie, you will need about 4 medium sized zucchini and one onion. Wash and trim off the ends and slice it thinly, leaving on the peel. 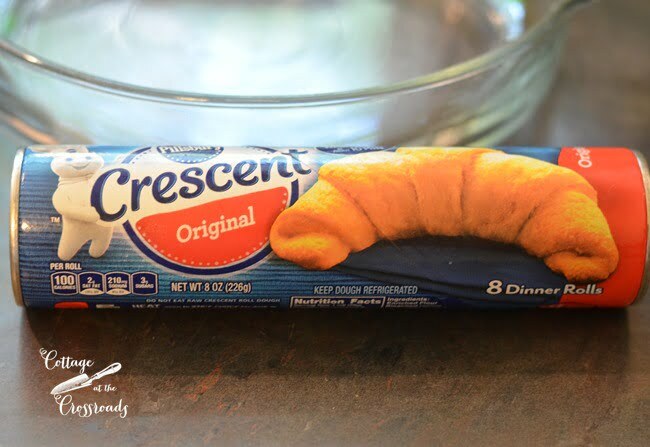 Open and press a can of crescent rolls into the bottom of an ungreased 10 inch pie plate. Firmly press the perforations to seal. Spread 2 teaspoons of mustard over the crust. Meanwhile, add 1/4 cup butter to a skillet and saute the zucchini and the diced onion until slightly tender. In a separate bowl, add 2 well-beaten eggs and 2 cups shredded mozzarella cheese. 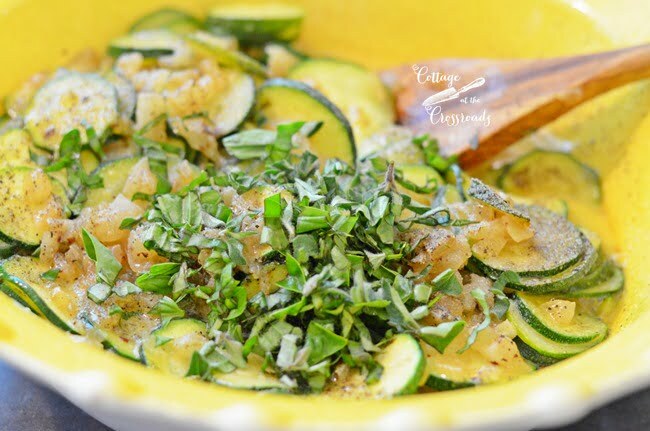 Add some spices to skillet with the cooked zucchini and onion such as 1 tsp dried parsley, 1/4 tsp garlic powder, 1/4 tsp dried basil, and salt and pepper to taste. Since I had some fresh herbs, I added those. 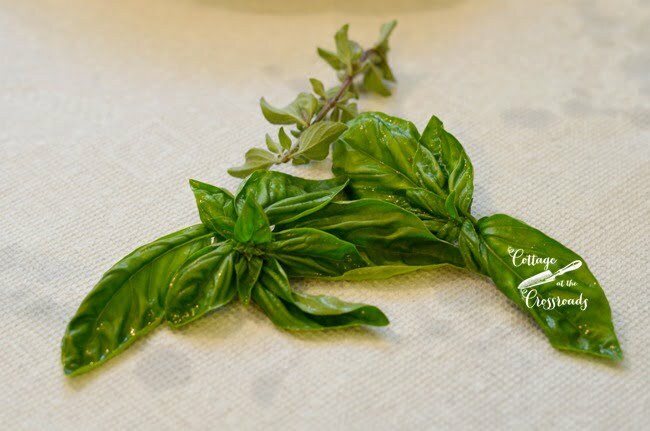 If you are using fresh herbs, add 3 times the amount of dried herbs called for in the recipe. Add the cooked zucchini mixture to the bowl with the beaten eggs and mozzarella cheese. 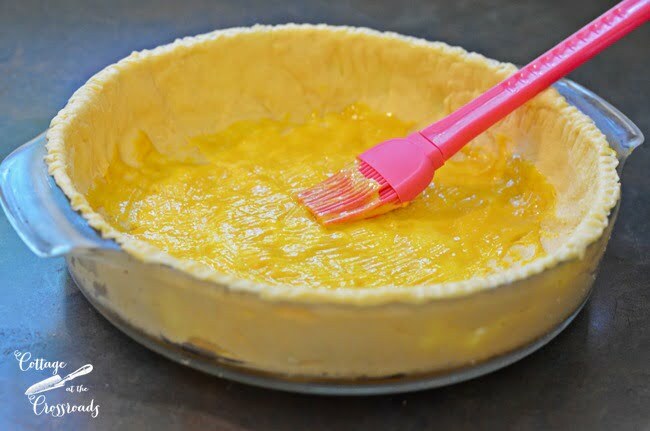 Pour into the pie pan that you lined with the crescent rolls and mustard and bake at 375 degrees for 18-20 minutes or until a knife inserted in the middle comes out clean. If necessary, add a little foil around the edge of the crust during the last few minutes of baking. I did a little googling to find out more about Ron’s recipe. Turns out that this recipe was the $40,000 grand prize winner from the 1980 Pillsbury Bake-Off Contest that year. I’ve read that it freezes well although I have not done so. 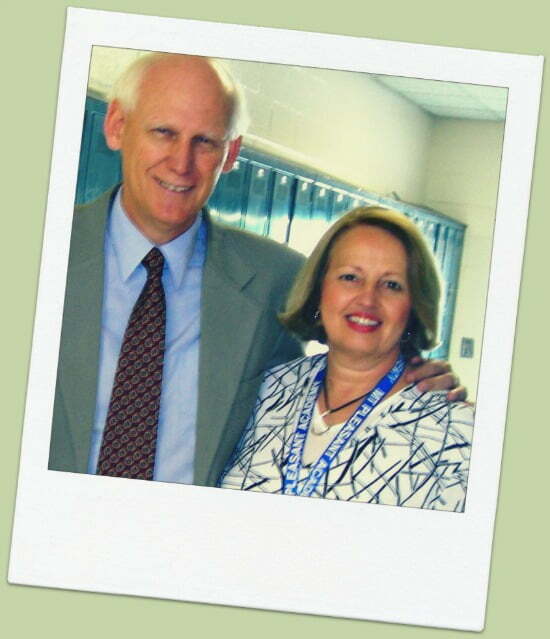 I enjoyed this pie that Ron prepared for us teachers at least once a year. We taught 5th grade together for about 12 years, and the first taste of this pie brought back so many wonderful memories. You know, teaching school is not always work! 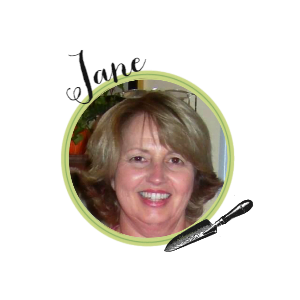 Teachers have a little fun now and then, too! 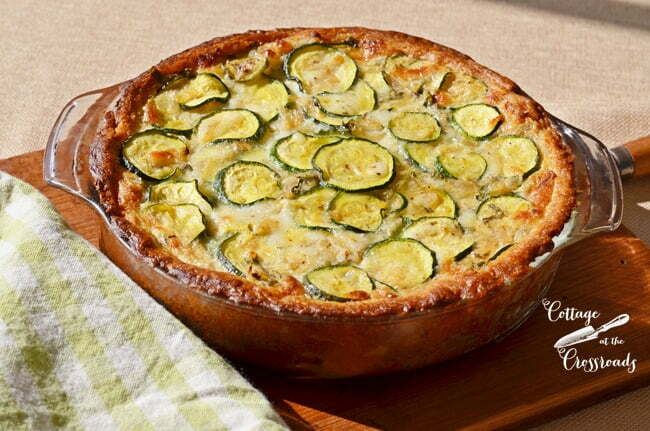 A delicious, savory pie that makes the most of a bounty of zucchini. 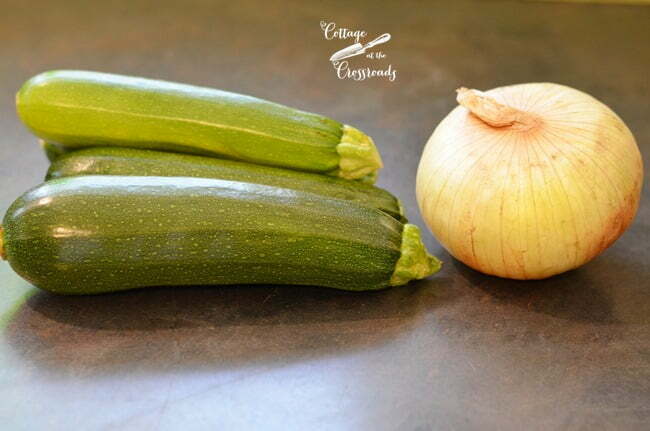 Add butter or margarine, onion, and zucchini to a skillet and cook until slightly tender. Mix the beaten eggs and the Mozzarella cheese in a bowl. Add the cooked zucchini mixture to the eggs and cheese and mix together. Line a 10 inch pie plate with the can of crescent rolls and spread 2 tsp. mustard over the crust. Pour the mixture into the pie plate and bake at 375 degrees for 18 to 20 minutes. You may have to cover the crust with strips of aluminum foil during the last few minutes of baking to avoid overbrowning. 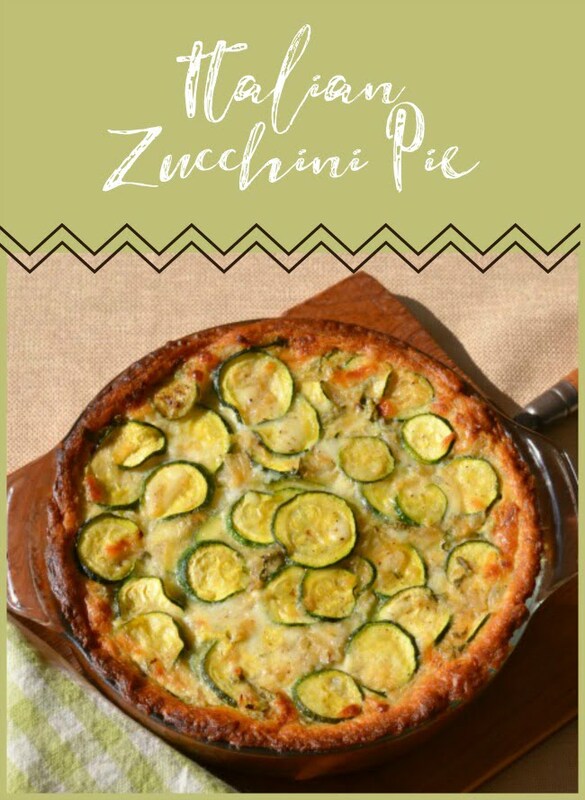 We didn’t plant a veggie garden this year, but there are plenty of farm stands around here so I’m going to pick up some zucchini (which I can never spell correctly even though I’m quite a good speller – some words just beg for spell check) and make this for dinner tonight. We were going to a swim meet in another town tonight, but a pipe broke to their pool, so it is cancelled so now I have to figure out dinner. This sounds delicious! Thank you so much for the tour yesterday. Your garden is remarkable. Today, I was helping at a church chicken bog and mentioned the garden to the people serving on each side of me. They both knew where the garden was and were so interested that you let me walk through the garden — and see the fountain! Thank you so much for your gracious hospitality and … the zucchini pie looks great … Will let you know how it is received in my house(when I get around to making it!). Many thanks. Now this one is a keeper!….Will be added to the recipe box….looks wonderful and glad it brings back such great memories! I can’t wait for the local zucchini is ready to make this pie. I just love savory recipes like this! Perfect for my Italian family to try. Pinned! 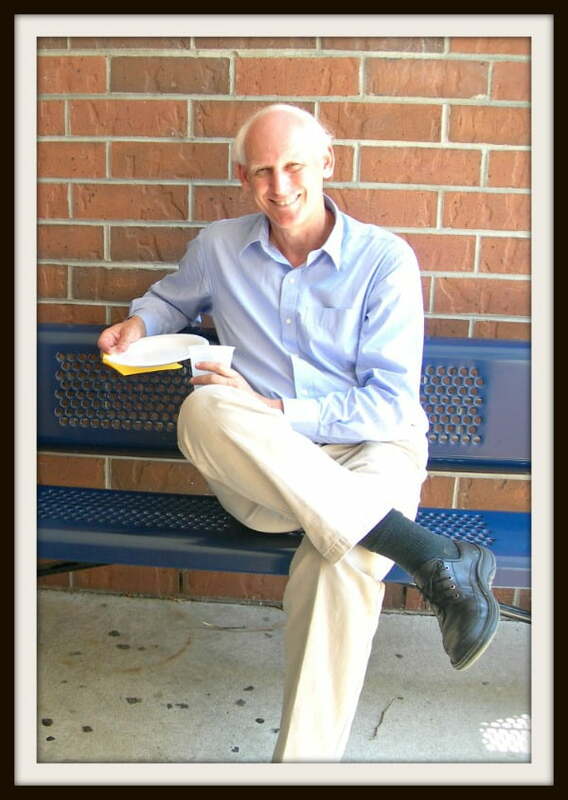 Have a happy week and enjoy your summer vacation. Connie, I have always wanted to try frying the blossoms and stuffing them with cheese sounds so delicious! Do you have a recipe on your blog that we can link to here? 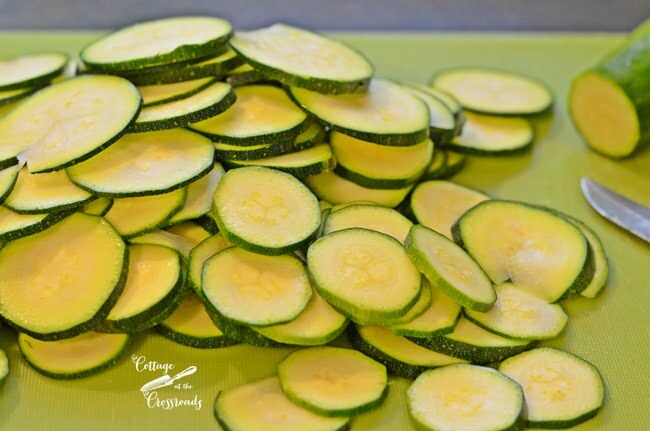 Such an easy and delicious way to use zucchini! 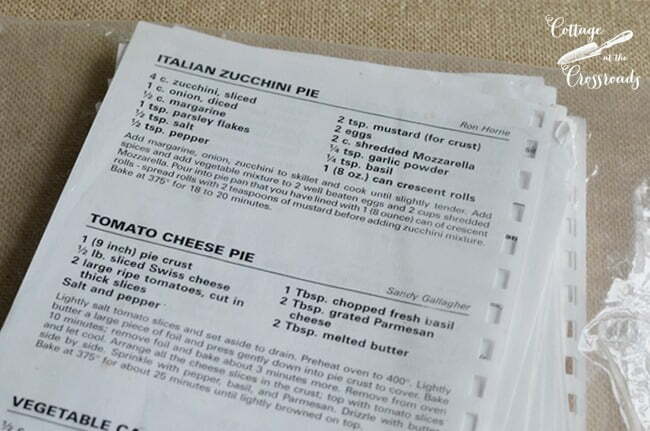 No wonder it won the recipe contest back in the 80s! Yes, Barbara! I’m so glad Lucy didn’t destroy the whole cookbook!